It's hard getting out of the old habits that we were so accustomed to years ago. This list will help you revamp your regimen to reflect your hair in the state it is in now--natural. 1. You brush your hair dry. 2. You use drying gel on your edges. Relaxed hair can usually withstand the drying effects of short-chain alcohols like Ethanol, Ethyl, Isopropyl, or Benzyl. However, these cause natural and curly hair to lose moisture. Look for an edge tamer made with one of these good alcohols, instead. We get that some hairstyles call for smoother edges, so go next time for a water-based tamer made with moisturizing carrier oils to penetrate moisture but still maintain a healthy hold along the hairline. 3. You use products with mineral oil. This ingredient is found in many products. It clogs pores, preventing hair growth and inducing a dirty, oily scalp--sometimes promoting the chance for bacterial infections, too. When our hair was relaxed, we used this (hair grease) to protect our scalp from the harmful side effects of a possible chemical burn on our scalp, forehead, and neck. This product is now unnecessary for natural hair. Use a hair cream or moisturizer rich in nut derived oils and butters so you can feel the same effects of what hair grease used to give you on relaxed hair. 4. You use bobby pins and rubber bands. When our hair was chemically straightened, it might have been ok to create intricate updos with metal bobby pins and rubber bands. Naturally textured hair in its unaltered state shouldn't be subject to the breakage factor when it comes to these styling items, however. When using a bobby pin, face the curved side downward to go with the flow of your curl pattern, and never use it on the very end of your hair. Leave about a half-inch, if possible, unexposed to the pin-down. Rubber bands should be tossed out completely--that long-term friction is damaging to the hair shaft. 5. You tie your hair up into a tight ponytail. The ends of your hair aren't the only part to focus our care on. Your edges need love, too--tight ponytails put an unnecessary amount of tension on the root. Doing this too frequently may result in extra hair fall, a thinning hairline, and a compromised curl pattern, over time. Use a Goody Ouchless ponytail holder not only to secure your style, but to blend in with your hair color, too. 6. You use silicones everyday. 7. You apply heat on dry, unconditioned hair. 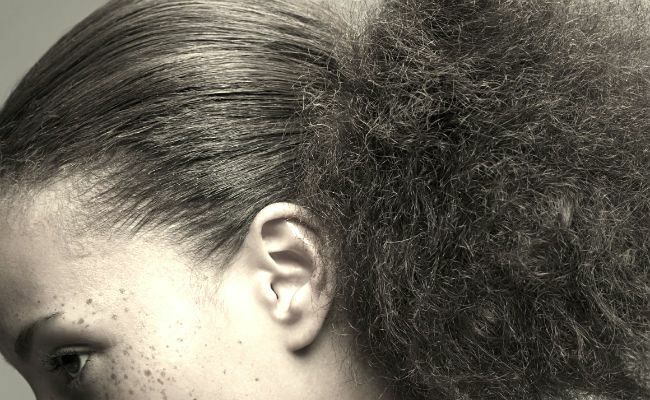 Do you have any bad hair habits that you would add to this list?